A few weeks ago I mentioned my imaginary friend Shorty. Things have gotten worse. Now I have a whole bunch of imaginary friends. I had a party and invited them over two nights ago. It was a spur of the moment thing, so there was no time to invite real friends. 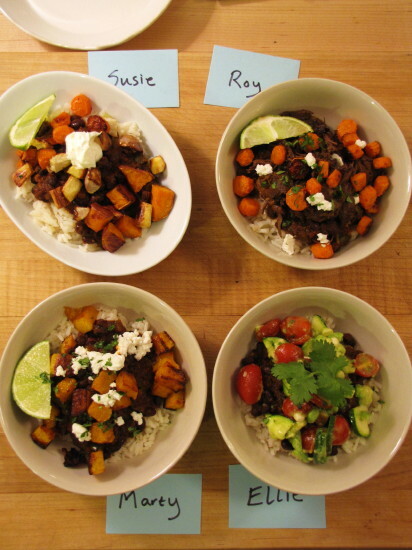 Not only did I want to test proportions, but I wanted to test different taste combinations. So I put little name cards next to the bowls as a fun way to indicate the different combinations. “I think I’ll blog about this,” I told Roy, who was looking at me with amusement. “No, I think I should write the next blog,” he said, “about what it’s like to live with a cookbook writer on deadline.” Needless to say, I’m keeping him far away from the keyboard. Happily both Roy and I and all of the imaginary guests (or as best as we can figure) liked all of the chili combinations. But everyone’s favorite vegetable topping for the bean chili was roasted butternut squash. 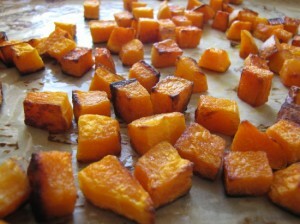 I nibbled on the squash as we were cleaning up (the guests did not hang around to do the dishes), and I thought about what a delicious side dish roasted butternut is, simply diced up and cooked on high heat. 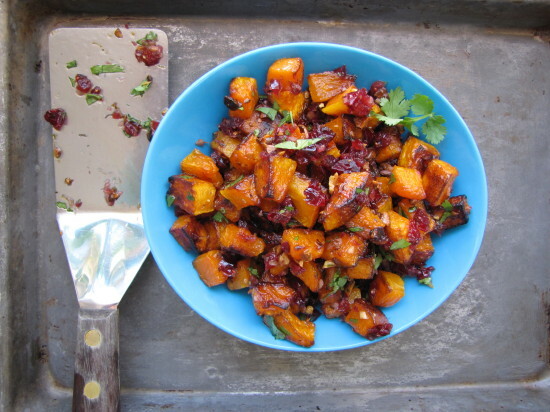 But even better, a super-quick flavored butter (my favorite has lots of chopped dried cranberries, fresh ginger, and a little lime in it) turns this earthy-sweet vegetable into a real star. So I’m passing along that recipe—since I can’t share the chili recipe just yet. The only problem with this recipe is portion size (ack—the bane of my existence!). Even if you scooch up the amount of raw squash to 1 1/4 lbs. (any more than this amount on one large sheet pan will steam, not roast), you still only wind up with about enough to serve 3 people as a side, because this is so tasty. At least you won’t have to invite any imaginary friends to eat the leftovers. Preheat the oven to 450°F. Line a large heavy-duty rimmed sheet pan with a piece of parchment paper. In a mixing bowl, toss the squash with the olive oil and 1 teaspoon salt. Spread the squash in one layer on the sheet pan. Roast, flipping once with a spatula after about 18 minutes, until the squash are tender and brown on the bottom and around the edges, about 12 minutes more or 30 to 32 minutes total. Meanwhile, melt the butter in a small saucepan over low heat and add the cranberries, the fresh ginger, and the lime zest. Stir well and cook to soften the cranberries a bit, about 1 minute. Take the saucepan off the heat while waiting for the vegetables to finish roasting. Transfer the squash to a mixing bowl. Reheat the cranberry butter to loosen it up if necessary. 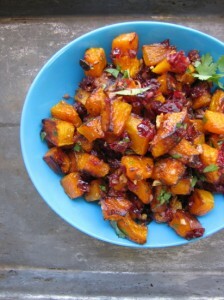 Add the ½ teaspoon lime juice, stir, and pour and scrape all of the cranberry butter into the bowl with the squash. Toss thoroughly but gently. Taste and add up to ½ teaspoon more lime juice if desired. Add the walnuts and cilantro (if using) and toss again. Serve right away. 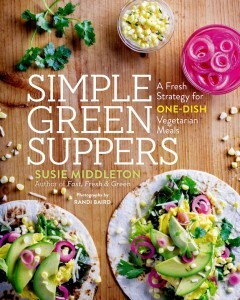 Click on a cover to order now! 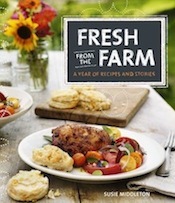 To see the list of current events on Susie's "Fresh from the Farm" travels, click on "About" on the Nav Bar at the top of the blog, and then click on "Events and Appearances" in the drop-down menu.